Designed for enterprise applications experiencing rapid data growth, the NEOxl 40 delivers the ideal combination of features and functionality aimed at reducing the overall cost of your long-term data storage solutions. Data transfer rates ranging from 504 GB/hr. to 8.6TB/hr. Meet backup windows and improve efficiency with high-performance data transfer rates that range from 504 GB/hr. to 8.6TB/hr. Keeping pace with today's incredible data growth rates is a significant challenge for IT professionals, especially when it comes to protecting that data seamlessly and affordably. The NEO XL-Series addresses the need for midrange and enterprise businesses to do more with less by providing effortless automated backup that combines flexibility, density, high-performance and affordability to ensure that data is protected faster, smarter, easier and more cost effectively. 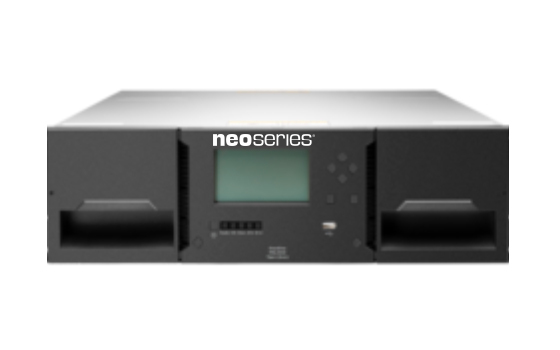 The scalable design of the NEO XL-Series allows customers to customize their backup and archive solution by starting out as a 6u, 60-slot, single-drive library and scaling to as many as 560 slots and 42 tape drives. The seamless design of NEOxl libraries allows you to add both data cartridges and tape drives as you scale, instead of requiring you to chose between capacity or performance. Effortless expansion of your NEO XL-Series library occurs by simply connecting additional 6u modules, with a maximum of 7 modules in a standard 42" rack. Installation and configuration of additional modules is simplified with the use of either the webbased remote management interface or the touch-screen operator control panel. The scalable design of NEOxl libraries not only allows users to easily scale the library into a larger configuration, but it also enables simplified redeployment of individual modules into smaller applications. This flexibility makes NEO XL-Series the most ideal, most cost-effective solution for any midrange or enterprise environment. NEO XL-Series libraries provide convenient, simplified installation, setup and operation with a touch-screen operator control panel or web-based remote management. Removable cartridge magazines facilitate the loading, unloading and off-line storage of data cartridges, reducing media handling costs. Meanwhile, mail slots provide easy, secure access to individual tape cartridges without interrupting library operations, while NEOxl tape drives are easily added, removed or replaced to ensure effortless upgradeability and serviceability. NEO XL-Series libraries are designed to not only provide an affordable purchase price, but to deliver superior long-term cost of ownership. NEO XL-Series ease-of-use features and enterprise-class reliability ensure administrative, support and downtime costs are virtually eliminated, while the native partitioning functionality provides the ability to utilize a single library in a variety of applications. NEO XL-Series libraries provide the reliability required by today's demanding IT environments to ensure that your data is readily accessible and always available. Features such as redundant power provide access to your data in the event of a power disruption, while easily replacable tape drives and tape library modules ensure seamless reconfiguration should a support event occur and require replacement. All NEO XL-Series libraries are covered by a standard one-year, next business day onsite warranty. For customers requiring a higher level of onsite support, customers may upgrade to enhanced next-business day support or 24x7x4 hr response times for the most mission critical operations. NEO XL-Series tape libraries provide the ultimate in automated data backup, archiving and disaster recovery by delivering the flexibility, affordability and dependability required for midrange and enterprise-class operations. With a reliability rating of 2,000,000 load/unload cycles, NEO XL-Series libraries provide the high reliability required by enterprise-class environments. Download the NEO XL-Series Datasheet (PDF).